The Japan Professional Basketball League revealed which divisions the remaining 25 clubs have been allocated to for the new men’s professional circuit, which tips off in 2016, at a Tokyo news conference on Saturday. Assignments for 20 clubs had already been announced in late July, and now all 45 teams have been given their destinations. The 12 clubs that were placed in the first division last month were joined by six more; the Hitachi Sunrockers (currently in the NBL), Niigata Albirex BB ( bj-league), Shiga Lakestars (bj-league), Levanga Hokkaido (NBL), Toyama Grouses (bj-league) and Yokohama B-Corsairs (bj-league). A total of 13 clubs, including the Iwate Big Bulls (bj-league), Shimane Susanoo Magic (bj-league) and Hiroshima Dragonflies (NBL), were assigned to the 18-team second division. The Saitama Broncos, one of the original six members of the bj-league during the inaugural 2005-06 season, and five others are headed to the third division, which is a de facto semi-professional circuit. The JPBL also announced it would utilize a three-conference system in the first and second divisions. Each conference (East, Central and West) will have six teams. There will be promotions and relegations between the first and second divisions, as the two bottom teams of the first division will drop and be replaced by the top two in the second division. An additional team from each division will play a promotion/demotion playoff(s). The league hasn’t decided if it will be a series or a single game. The league is considering applying a promotion/demotion system between the second and third divisions as well. 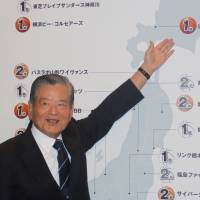 As the league selected teams to fill the six remaining spots for Division One, JPBL executive Masaaki Okawa said that Hitachi and Shiga qualified under the major criteria it had set (namely a 5,000-seat arena, revenue of at least ¥250 million and support from the local basketball associations) first. Niigata and Hokkaido then followed. Okawa said the JPBL had Iwate, Yokohama, Toyama and Shimane on the table, but the B-Corsairs and Grouses edged out the other two. 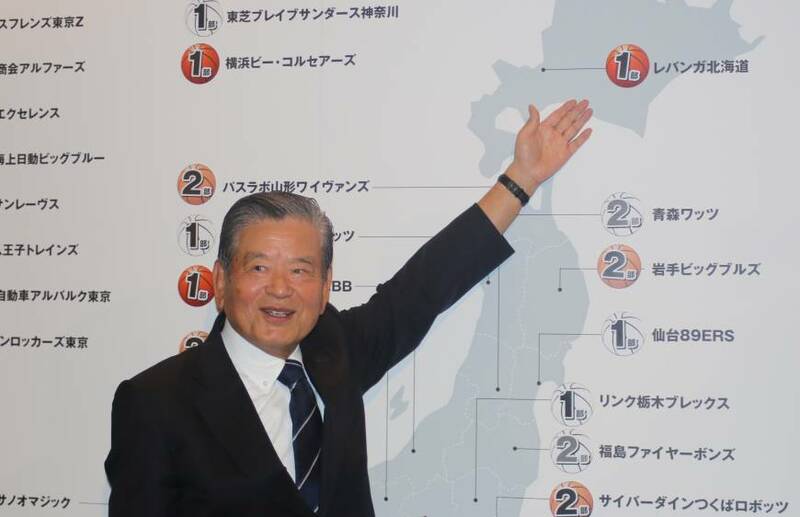 Kawabuchi said he and league officials wanted to have at least one franchise from the Chugoku, Shikoku and Kyushu areas in the top division to provide better balance (the Okinawa-based Ryukyu Golden Kings have also made it). But none of the clubs in those regions were able to meet the qualifications. Per FIBA’s request, which came while the JBA was banned by the sport’s global governing body last November, a suspension that was lifted earlier this month, the first division was originally going to have 12-16 teams. Yet Kawabuchi, one of the J. League’s founders, opened the doors to 18 clubs. Division assignments: These are based on announcements made in late July and on Saturday by the Japan Professional Basketball League. First division (18 teams) —from the NBL: Aisin SeaHorses, Chiba Jets, Hitachi Sunrockers, Levanga Hokkaido, Link Tochigi Brex, Mitsubishi Electric Diamond Dolphins, Toshiba Brave Thunders and Toyota Alvark; from the bj-league: Akita Northern Happinets, Hamamatsu Higashimikawa Phoenix, Kyoto Hannaryz, Niigata Albirex BB, Osaka Evessa, Ryukyu Golden Kings, Sendai 89ers, Shiga Lakestars, Toyama Grouses and Yokohama B-Corsairs. Second division (18 teams) — from the NBL: Cyberdyne Tsukuba Robots, Hiroshima Dragonflies, Kumamoto Volters and Nishinomiya Storks; from the NBDL: Earth Friends Tokyo Z, Passlab Yamagata Wyverns, Renova Kagoshima, Tokyo Excellence and Toyota Tsusho Fighting Eagles; and from the bj-league: Aomori Wat’s, Bambitious Nara, Fukushima Firebonds, Gunma Crane Thunders, Iwate Big Bulls, Oita Ehime HeatDevils, Shimane Susanoo Magic, Shinshu Brave Warriors and Takamatsu Five Arrows. Third division (nine teams) — from the NBDL: Aisin AW Areions, Otsuka Alphas, Tokio Marine Nichido Big Blue, Tokyo Hachioji Trains and Toyoda Gosei Scorpions; from bj-league: Kanazawa Samuraiz, Rizing Fukuoka, Saitama Broncos and Tokyo Cinq Reves.